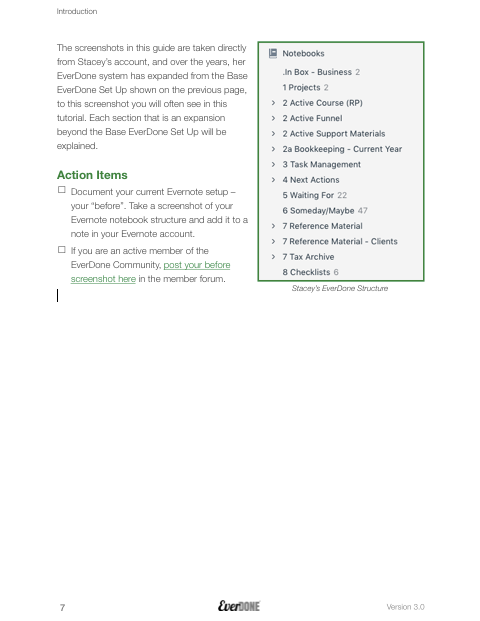 EverDone® documents and teaches the workflow structure and actions you need to take to replicate Stacey's EverDone® system in your Evernote account. When you deploy and embrace EverDone®, you'll learn how to use Evernote as much more than a note-taking and digital storage software. You'll learn how to also use it as your daily task and project management tool. You'll create a digital life that is centralized and searchable. All of this is possible when you know how to properly structure Evernote for GTD, and you apply the principles that David Allen teaches on a consistent basis. EverDone® is the trusted system that Stacey Harmon developed in 2012 and has used every day since then. The structure she created has scaled, and the foundations of the structure are the same as when she originally designed them. Her account currently houses over 26,000 notes and because she is centralized in Evernote, she can retrieve whatever she seeks easily as the need appears. Join Stacey in creating a trusted system in your Evernote account. You’ll learn how to structure and work GTD in your Evernote account so that, as David Allen promises, you too can have “mind like water” and “stress-free productivity”. 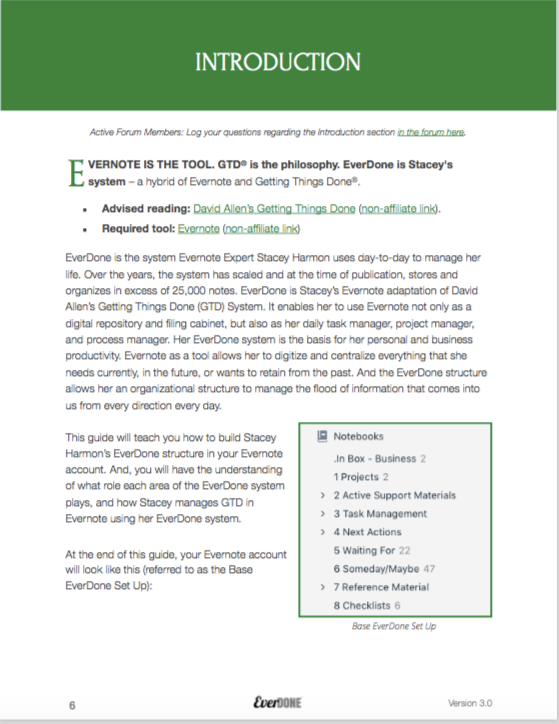 The EverDone® Guide: Immediate access to Evernote Certified Consultant Stacey Harmon's 72 page EverDone® Guide. 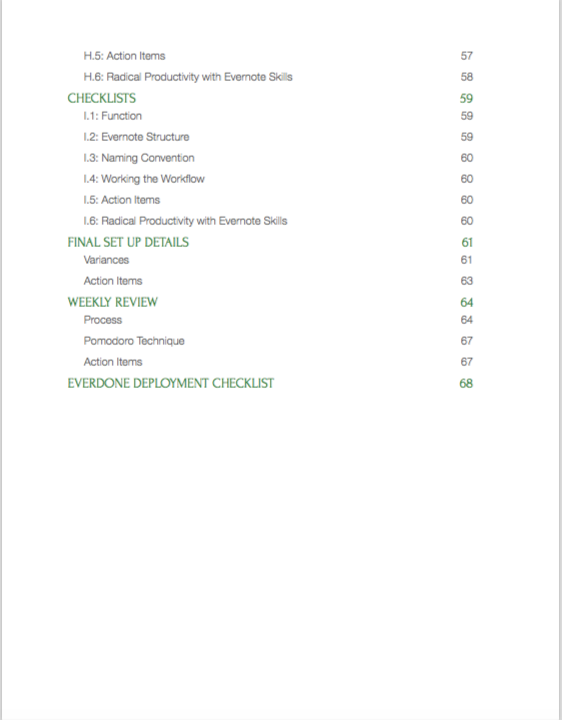 Lifetime updates to the EverDone® Guide – for free. Ultimate In Box Training Video: Get on-demand access to a 50 minute training where Stacey shows how she centralizes everything in Evernote. Access to the Private EverDone Facebook Group: Get access to the EverDone Forum, a vibrant community of your fellow GTD® and EverDone practitioners, that is moderated by Stacey. The forum gives you the access and support you need directly to deploy EverDone in your account and maintain an effective GTD® lifestyle. Monthly Live Q&A Sessions with Stacey: Inside the private EverDone Forum on Facebook, Stacey hosts a live Q&A where you can get your questions about EverDone answered. The sessions get recorded so even if you can't attend live, you can post your question and get your answer in the recording when convenient for you. Monthly Live Weekly Review Sessions with Stacey: Each month, Stacey hosts a private Zoom call exclusively for community members where you do your own weekly review alongside Stacey and other EverDone practitioners. This session is an outstanding way to hold yourself accountable for executing on what David Allen promotes as an essential part GTD. If you struggle to do a weekly review, this will help you to get in the habit. First Month Community Membership for FREE: There is zero risk! Join the community, absorb the bonus training that exists there, and engage with the group for 30 days for free. After that, you'll be charged month-to-month, and you can cancel at anytime. 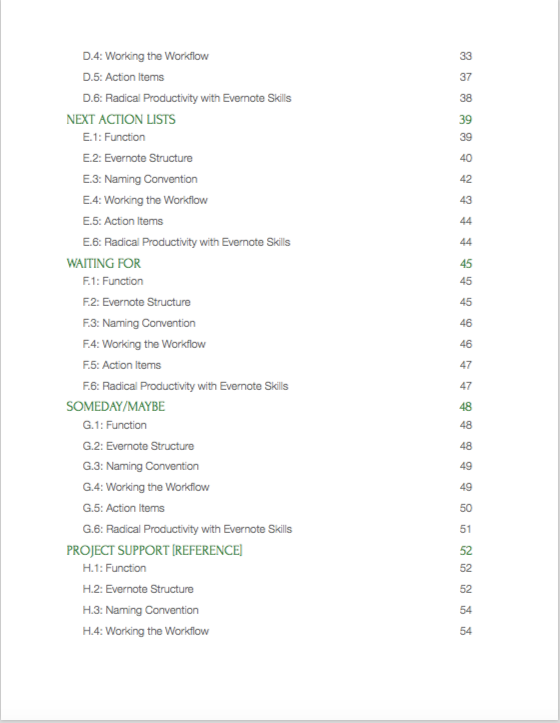 Q: How is EverDone different than Radical Productivity with Evernote? 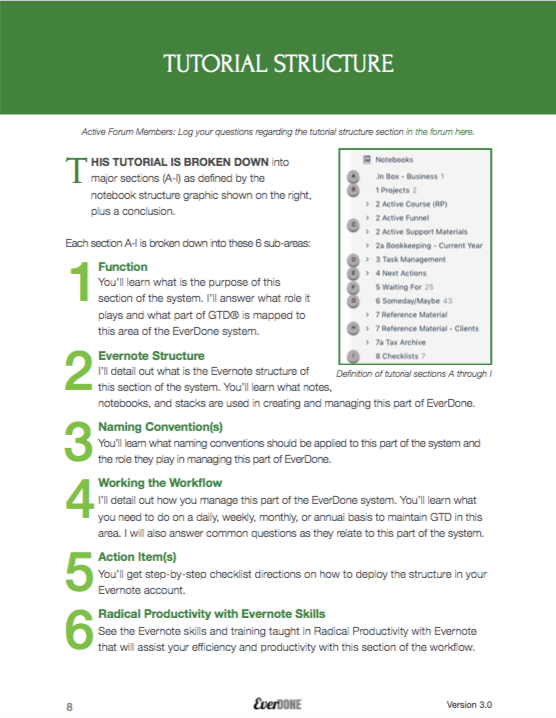 A: EverDone is a workflow system, where Radical Productivity with Evernote teaches the Evernote skills you need to master the software on any platform. You need to be both Evernote fluent and have a workflow to be truly effective with Evernote. Q: Is the EverDone Guide for both Windows and Mac users? A: Yes. The structure and habits detailed in the system are for all Evernote users, no matter which platform you access the device on. Keep in mind that EverDone doesn't teach you Evernote. Instead, it teaches you what structure to create in your Evernote account which is common no matter what platform you access Evernote on. There are variations in how you – for example – move notes around or create stacks on Mac and Windows. These differences are taught in Radical Productivity with Evernote. 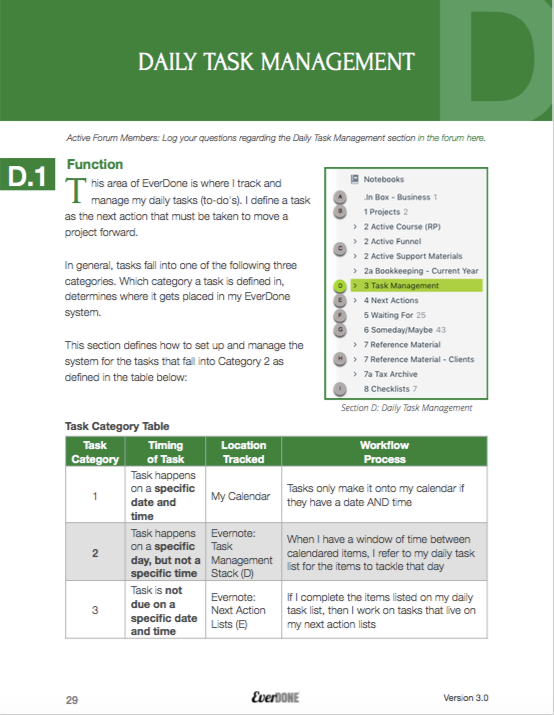 Q: What tier of Evernote service do I need to deploy EverDone? A: You can deploy EverDone no matter which level of Evernote service you have...even the free version (Evernote Basic). Q: Do you teach GTD in EverDone? A: EverDone assumes that at the minimum, you have read David Allen's Getting Things Done book. EverDone does not teach his principles. Instead, it teaches how to deploy a structure in Evernote that will allow you to manage your life and digital data in Evernote using David Allen's philosophy. EverDone also assumes that you have a basic working knowledge of Evernote (at the minimum, you should be familiar with the free desktop version of Evernote and able to create notes, notebooks and stacks). Q: How is EverDone different from The Secret Weapon? A: The Secret Weapon is a tag based approach to organizing Evernote. 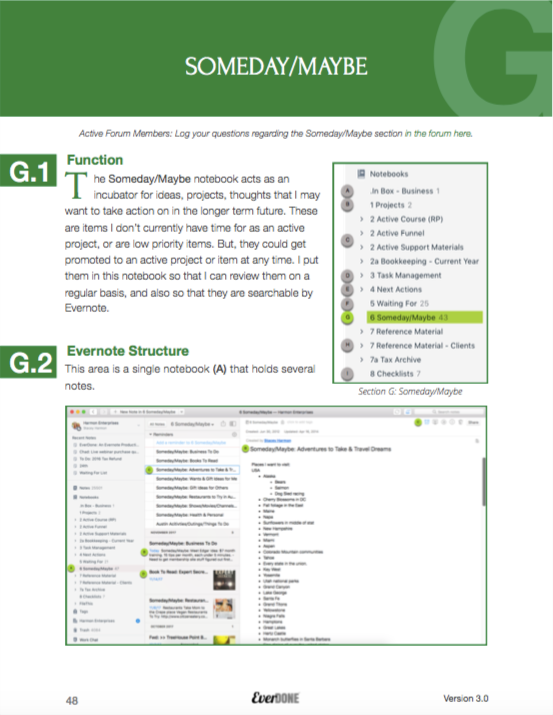 EverDone is a note, notebook, and stack organizational approach based on Stacey Harmon's expert understanding of the features and constraints of Evernote. You certainly can still use tags in your own EverDone deployment but the organization of the data in an EverDone system is based around notebooks and stacks.